2008 was a tough year, but apparently it wasn't equally as tough for everybody. Audi has now reported that it broke through the 1 million unit mark last year, selling more vehicles than it ever has before. Total global sales in 2008 came to 1,003,400 vehicles - up 4.3% over last year - including 82,000 units in December. But while the American market has typically been a vital region for European premium marques especially, U.S. sales dropped 6.1% for Audi this year, and nearly 10% in December when U.S. sales accounted for less than 10% of the company's global sales. Ingolstadt attributes its sales success to the dozen new models it introduced last year, including the Q5 and A4 (seen above). Thanks to everyone who sent in the tip, and check out the press release after the jump. While the auto industry was hit with depressing sales during 2008, Audi AG announced today that it reached its objective of selling more than one million cars in 2008 for the first time in its history. Audi said that its unit sales jumped by 4.1 percent over 2007 - for a total of 1,003,400 vehicles sold worldwide. December sales for Audi jumped 17.4 percent with a total of 82,800 units sold. The German automaker said that about 12 new or upgraded models helped boost overall sales. The most important introductions for Audi last year was the new A4 sedan and the new Audi Q5 SUV followed by upgrades to the A3 and A6. "We'll continue to draw on this strength in the difficult year of 2009," Rupert Stadler, Chairman of the Board of Management of AUDI AG, said in a statement. "We have ambitious long-term goals: We want to make Audi the most attractive premium brand worldwide." Audi saw strong growth in the European and Asia-Pacific regions. In Western Europe, Audi sold some 667,000 units, 2.5 percent more than it did in 2007. In the Asia-Pacific region about 155,100 customers bought an Audi vehicle. IN the U.S. Audi sold a total of 87,760 units in 2008. Audi has recorded sales of over one million cars in a 12 month period for the first time, and at the same time achieved its 13th record year of sales in a row. Worldwide, the carmaker's sales increased 4.1% through 2008, with 12 new models and expansion into new markets helping to boost the numbers. 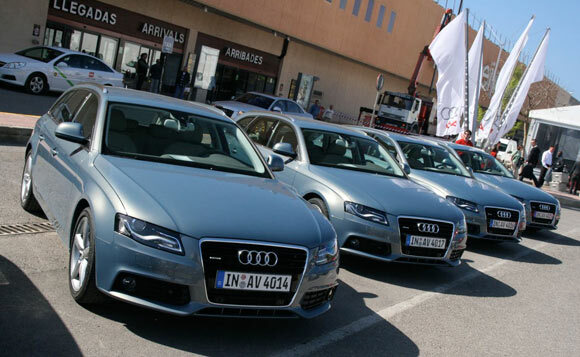 In 2008 Audi sold a total of 1,003,400 cars worldwide, up from 964,151 the year before. With the newly introduced Q5 and the new A4 family, sales in December alone increased by 17.4% over the prior year's December.